The customer’s vision of his ideal camper was one which had a long focal length when viewed from the cab. 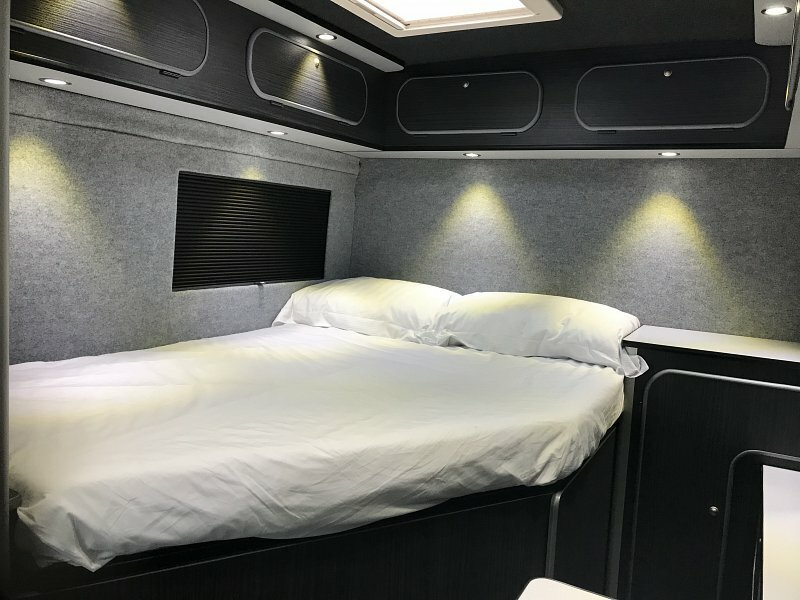 Having supplied us with the L4 version of the Ducato, our solution was to give him a longitudinal tapered bed and make a feature “vanity unit” leading to a wardrobe at the end of the vehicle. As a design statement, the contrast of dark furniture and silver worktops give an overall monochrome effect with the silver tambour doors, edgings and lights. The “French Bed” design allows access from a larger area than a standard transverse bed and the walk through area adjacent to the bed features a vanity area comprised of a wide wardrobe, dressing table compartment and wall-mounted mirror. The units along the sliding door have a long worktop down to the bed area and the opposing kitchen is set back from the centrally located washroom. The standard double passenger seat has been exchanged for a single chair and both seats are mounted on swivel plates that rotate into the cab. A removable island table is used to form a front dinette. The double bed is tapered at the foot-end to allow access down the side. The large storage space underside is accessed either from the rear doors or the internal tambour door. The bed height has been set to allow a thin mattress to be laid in the storage area to provide, if necessary, a cosy sleeping cabin for a child. The kitchen equipment comprises a Smev oven and a 3-burner hob within one workstation. The large compressor fridge and sink are situated opposite within a long worktop area, further extended with the hinged panel. The washroom comprises a shower, hinged sink and electric flush toilet.